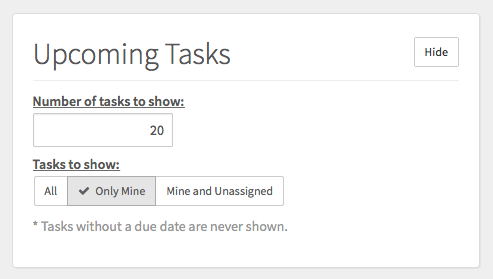 How to best track job assignments by team member and customize user preferences. Below are some suggestions for the best tips on handling a team of employees for your business within your Táve account. Some of these may not be applicable to your account, depending on whether or not you are providing your team members with access to Táve. Does one particular employee handle certain things in your workflow? You can assign them to the appropriate tasks in your job and deliverable workflows so when they're logged into your account, they can see exactly what they need to take care of right from the dashboard or from the left Tasks sidebar. Each account user can choose which widgets to show or hide on their account dashboard, so they can see what is most important to them when they log in. 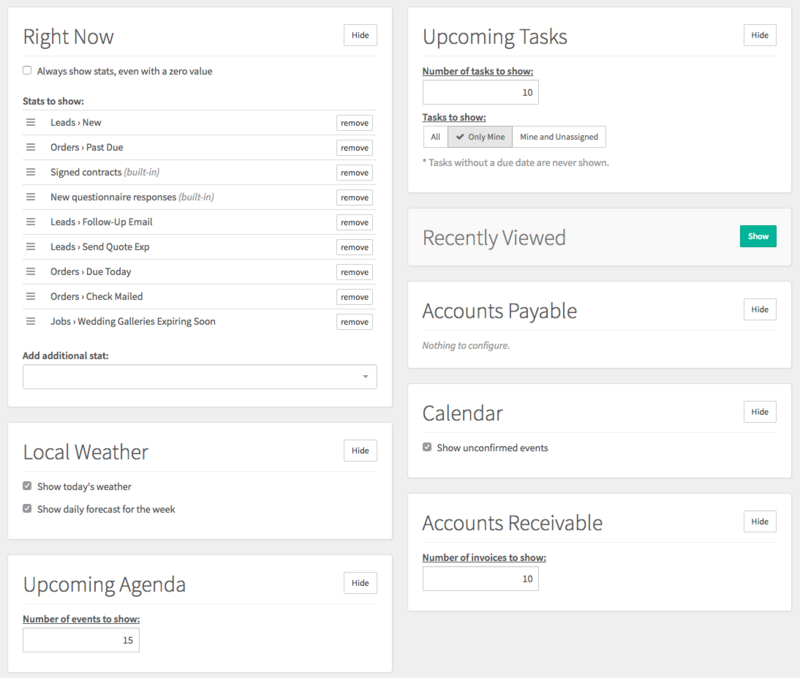 A lot of the dashboard widgets have options that can be customized, such as showing a certain quantity of upcoming tasks and only seeing those tasks that they are assigned to accomplish. Create separate Event Types for tracking each employee's availability (or black out dates) and have each employee log their availability as things come up. This option requires that the employee have access to your Táve account. Have each employee manage their own outside calendar feed in Google Calendar or iCal for tracking their availability and subscribe to each of these feeds in Táve in Settings › Calendar Feeds. As they update their feed, it will update in Táve as well so you can check one place to see who is open for a specific job as it gets booked. This option doesn't require that the employee have access to your Táve account. If you have more than one employee set up as a user within your Táve account, you have the option of creating one or more dedicated calendar feeds that are tied to their assigned events. 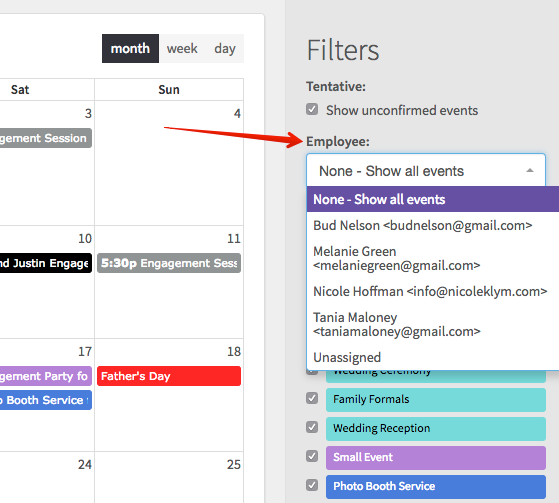 Within your different day, week and month calendar views, you'll see the Employee filter option to just show the events a specific employee is an attendee on. 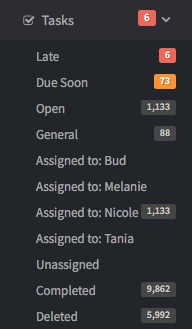 Another way to see your different employees' assignments is by using sidebar reports discussed in our Organization section. For example, in this sidebar report shown below its results will display all of the wedding ceremonies coming up that Melanie Green is attending by using the Employees Attending filter. You can also create custom sidebar reports in your left Jobs sidebar for your employees by filtering based on who is in the Photographer job role, so each person can have easy access to a quick list of their jobs they're responsible for at all times. The example below will result in just those jobs who has someone named Nicole assigned to the Photographer job role on the job's worksheet.